Paarl is a mere 45 minutes from Cape Town and within close proximity of Stellenbosch, Franschhoek, Wellington, Swartland and other Cape Winelands destinations. With easy access of the N1, this historical wine route is the gateway to the Cape Winelands. 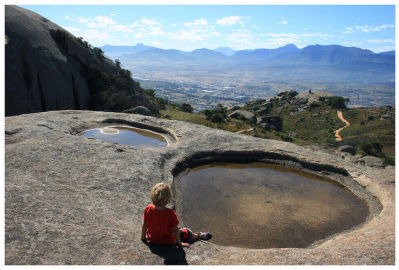 Paarl offers historical charm, culture, architectural heritage, wine and fruit farms, breath-taking scenery and many cycling and nature trails. The magnificent countryside, good wines and friendly people welcome you to a town where a feeling of tranquillity still transcends modern day living. The Paarl Wine Route offers visitors a diverse wine and country living experience. From the large international wine companies to the small micro-producers who share the passion to produce quality wines with a sense of place to give pleasure to the lovers of wine. The Paarl Wine Route offers you a unique and rare opportunity to live and experience life, as it really is in the wine lands. A true taste of Paarl is staying over on a working wine farm, enjoying fresh produce for the valley along with some of South Africa's finest wine. Make Paarl you base from where you can explore the rest of the Cape Winelands and after each day return to a tranquil setting. The Park is not involved in commercial breeding or trade and offers lifetime care to all of it's animals. 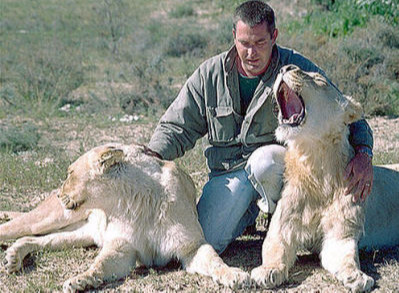 All the animals brought to the Park are captive bred / hand reared and cannot be rehabilitated to the wild. The animals at the Park are assured a chance of living out their natural lives in an enriched and safe environment. Butterfly World Tropical Garden, one of the more unique attractions of the Western Cape Winelands, consists of a tropical garden in a 1000 m2 green house. 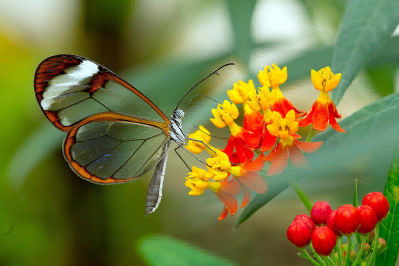 This luxuriant paradise makes the free flying exotic butterflies feel right at home along with many other interesting animals who now call Butterfly World Tropical Garden their home. The Drakenstein Correctional Centre was formerly known as Victor Verster Prison and is an unofficial attraction linked to the life and times of Nelson Mandela. Situated between Paarl and Franschhoek in the Cape Winelands, it was here, on a house on the property, that Nelson Mandela spent the last 14 months of his 27 years in prison.A low-security farm prison, it was previously used for lower-risk political prisoners on their way to being released. Mandela was transferred there from Cape Town’s Pollsmoor Prison in December 1988.Instead of being locked up in a cell, he was held in a warder’s home on the property – a house whose design he duplicated for his post-release home in the Eastern Cape village of Qunu. Mandela and his wife, Winnie, walked triumphantly through the gates of the prison on 11 February 1990. 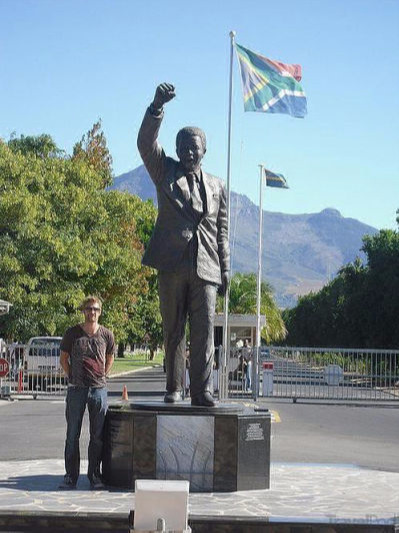 A bronze statue of Mandela by sculptor Jean Doyle stands at the prison gates, depicting him on the day of his release. The house where he lived can also be viewed by the public. Whether you’re a small fry or a big fish, an escape into the enchanting world of the Two Oceans Aquarium is bound to be an unforgettable experience. 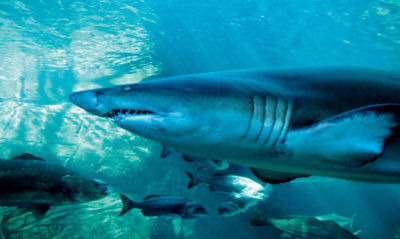 With more than 3000 creatures and 88 species on show, the aquatic entertainment land gives both adults and little ones the chance to come face-to-face with predators of the deep, fish as multi-coloured as the most vibrant rainbow, crabs the size of toddlers and feathered friends so lovable they don’t mind a soft pat on the head. Cape Peninsula , near Cape Town , is a real thrill. 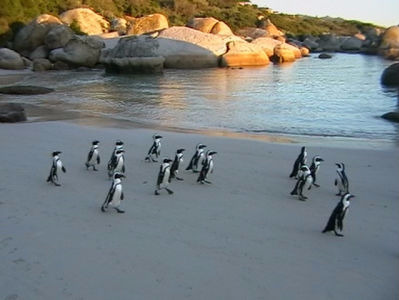 A small public beach is set apart from the main penguin colony that resides here (on Foxy Beach), but that doesn't stop the penguins from sitting on your beach towel or darting around your legs while you take a refreshing dip in the Ocean. Penguins like to walk about and generally ignore fences. A boardwalk has been built around the dunes so you can get a great close up look at the entire colony eating, breeding, preening, swimming and chatting away. 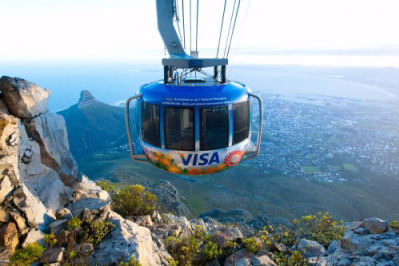 Experience summer’s longer days and balmy evenings atop Table Mountain by taking a cable car to the summit – and bring your camera to capture that #sunsetspecial moment!